The arena of modern day dating is a coliseum where the weapons are blunt, and the warriors who wield them are empathetically impaired. But, for whatever reason, we repeatedly pick up love’s trident, and nervously shuffle the sand between our toes, safe in the knowledge that our breast will again be punctured, and again we’ll be left empty on the floor, purely for the benefit of a judgemental audience. Thumbs down, Tinder. We are seldom entertained. So, why do we run that terrible risk? Probably because we want a caesar worthy to touch us in that verdant place within, that place with green fields and the sun on our face, to forever inhabit that romantic Elysium. Until then, call us whatever false name we put on our profile. However, it seems what we do on Tinder echoes in eternity, as the actions of those who have dated those before us, before us, have long been immortalised in newspaper type. The latest fight, recalls the blows suffered by a disappointed Tinderer, who upon realising there would not be a second date, took umbrage with the asking price of the libations he purchased that fateful evening. Now, I don’t want to stereotype here, but considering the image cropped up on Reddit, I’m suspecting that the aggressor of the piece, the gent seeking the refund, is the man who uploaded it. I have circumstantial evidence to support this. 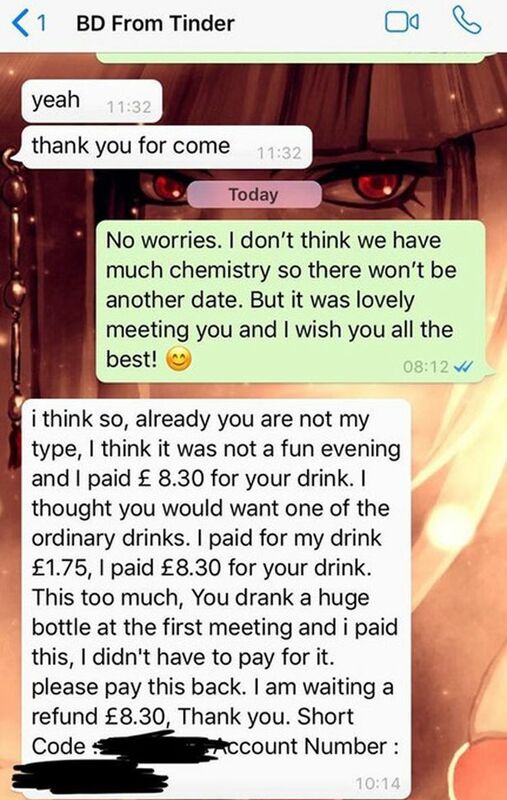 The unfair assumption the anime-themed background brings, that neckbeardian pomp of feeling that the issue was the drink he bought, but didn’t have to. Not the lack of chemistry felt at the table, but rather the chemistry kept in the glass on it. In quest of objective journalism, the woman in question only asked for a £2.50 Long Island Iced Tea during Happy Hour, which she happily offered to put on her card. But it was her date who decided to get a pitcher instead.